Time to bid farewell to 2016! I think I didn't complete many of my new year resolution in 2016. I didn't go to many places compare to the previous years, just made it to Melbourne, Sydney, Bangkok and Hong Kong. Well, instead of writing a sum up of my 2016; this year I want to write about my 2017 New Year's resolution. I don't have any specific places in my mind now, but I definitely wanna go to Xi An and Shanghai in the next year. 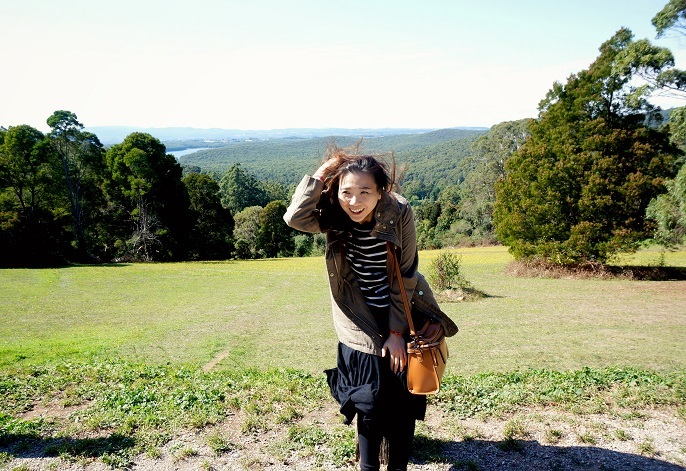 Life is too short for not travelling and explore the world, peeps! I used to read a lot when I was a child, but not anymore now. I feel like my brain is getting old, when I will restart my reading habit again?! I love blogging and I really enjoy sharing good things and my thoughts with my words. In 2016, I received more interesting reviews and events compare to the previous years; and I hope more exciting things are coming up soon! I want to go back to do some regular routine exercises in every week. Most of the times, I found myself hurrying too much. It creates a lot of stress in my body. I want to take the time in 2017 to slow down the hectic lifestyle and enjoy my life. To be honest, I'm an impatient person. In this brand new year, I want myself to be more patient. I want to learn to listen more than talk. I want to do it for long time when I saw many beautiful works out there. It's quite a big challenge for me as I'm not very good in drawing, as well as being creative. So, I want to challenge this in 2017. One of the biggest challenge of blogging is to gain followers and likes on the social medias. I hope that I can hit my desired targets with more likes, shares and followers on my blog, FB page, and Instagram. I wish my business can grow faster so that it helps me to earn more! No matter what it brings to, I want to earn more than whatever I earned from last year. I have a big dream in 2017, I will announce it when it is officially confirmed. Not only I hope, but indeed I want to get it so desperately. Probably this is the biggest dream ever in my life, so keep my finger crossed! I will make my 2017 new year resolution up to 10 now. If you haven't make your new year resolution, you can try do it now. It's fun to see how much you can achieve in a year. Last but not least, HAPPY 2017 to all of you! The most important thing is to stay healthy and happy all year long! 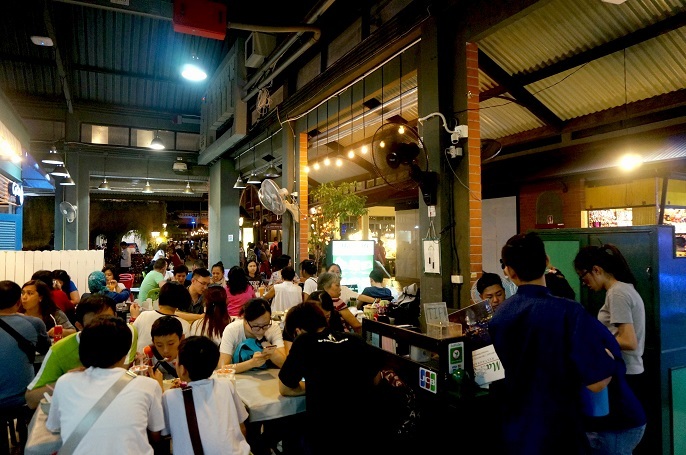 Ante Publika is a famous place for pork. They serve different kind of pork chops, pork burgers, pork pastas and they even have salads and starters with pork too. For pork lover, you gonna love this place and I am sure this will not be your last time visit there. I have been to Ante a few times, and also blogged about it during my second visit in 2013. Usually the place is packed on the weekend, and this is my first time having dinner at the restaurant. So, I was very surprised with the crowd on the Wednesday night because it was fulled with many people. If you plan to come here, I think it's better to just book in advance in order to secure the seats. Or else, you can get the outside seats. 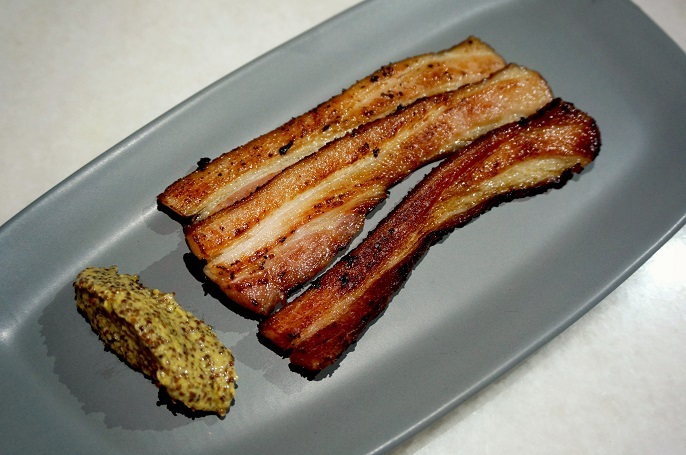 House Smoked Bacon @ RM19, with 8mm pork belly bacons. The price comes with 3 slices and in-house mustard sauce. 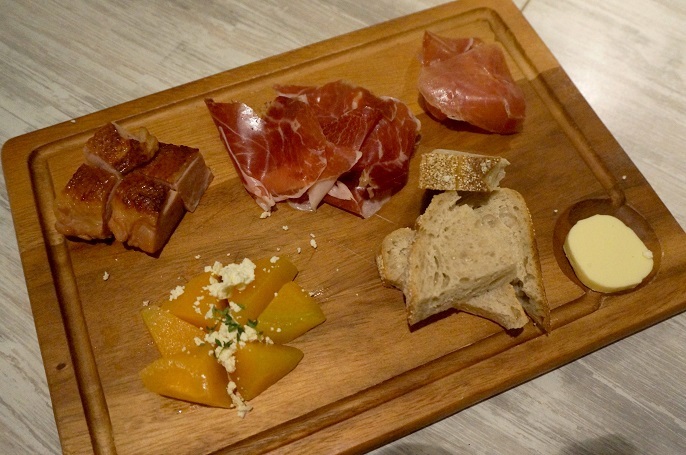 Tasting Platter @ RM46, has 3 different meats such as the Jamon Iberico Ham, Spanish Cured Ham and Smoked Duck Breast Cubes. All these meats paired with rockmelon and ricotta, as well as Sourdough bread and a slice of Lescure butter. Miso Pork Belly @ RM19, which is the best starter to have at Ante. 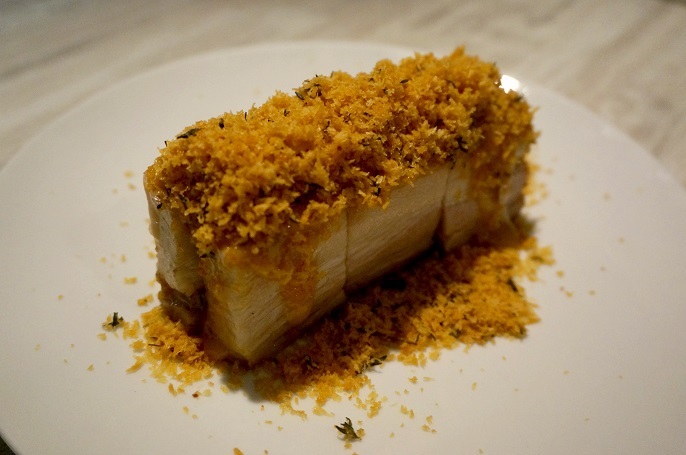 It's the signature roast pork belly with 12 hours slow cooked, which will literary melt when you take a bite. 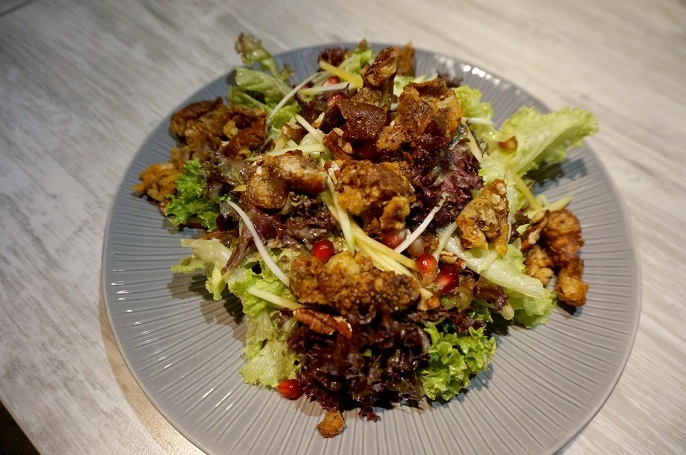 Ante also has a very good salad selection, such as the Crispy Trotter Salad @ RM29. It serves with mango, young papaya, pomegranate, trotter shavings, toasted pecans and French vinaigrette. If you like a little sour, you may try this as French vinaigrette dressing is made of white-wine vinegar. Another signature salad is the Garden Duck Salad @ RM27. This salad is slightly sweet because it comes with the orange brandy dressing. 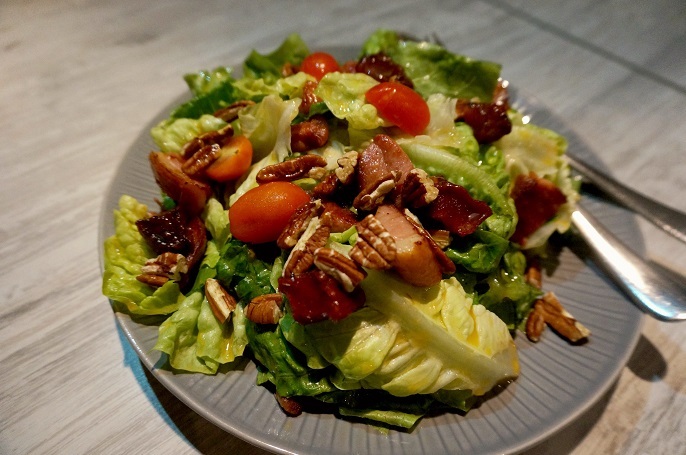 The ingredients of this salad includes duck breast slices, grilled watermelons, cherry tomatoes and toasted pecans. 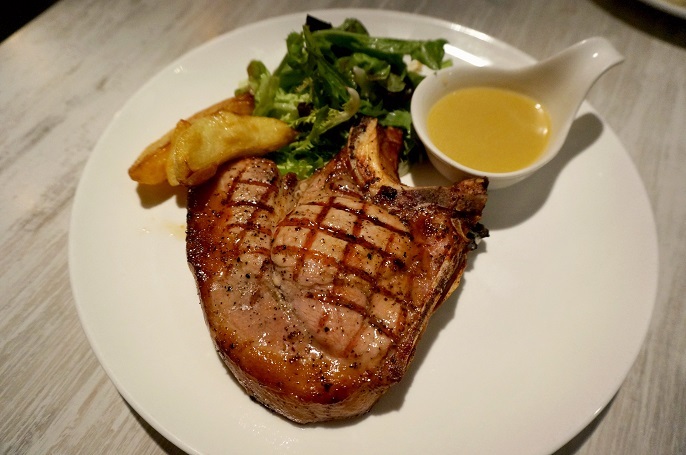 Move on to the signature pork chops at Ante. The Pork Striploin Diane @ RM42, is a seared pork loin with side dishes of russet potatoes and green pea mash. 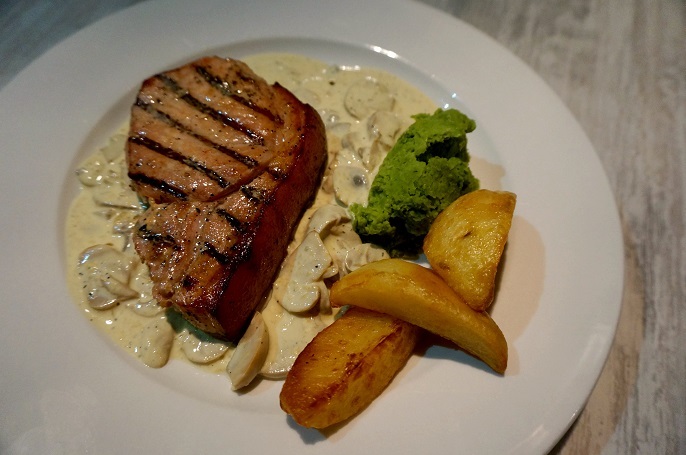 The highlight of this pork chop is the meat smothered in creamy mushroom brandy sauce. Pork Shoulder @ RM52, served with garlic rosemary sauce, mashed potatoes, frisee and oak lettuce as the side dishes. The pork chop, wow! It's so juicy and tender! 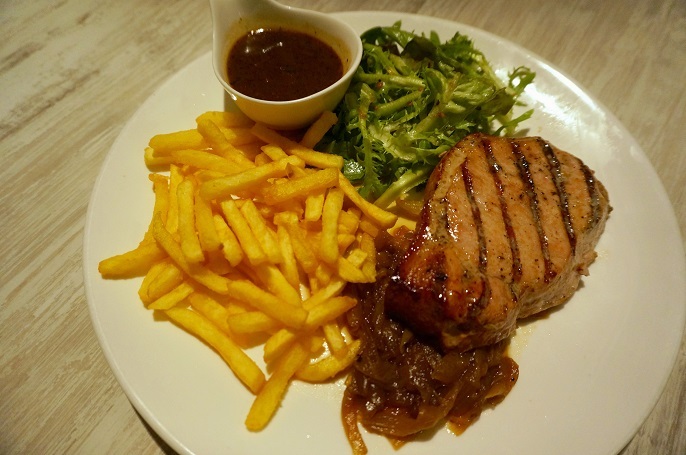 Pork Striloin @ RM38, served with caramelised onions, fries, frisee and oak lettuce as side dishes. If you like black pepper, you should go for this because it serves with traditional black pepper sauce. 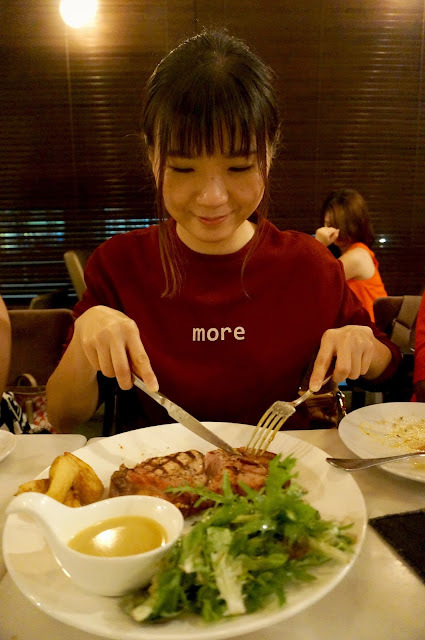 Signature Chargrilled Pork Ribeye Steak @ RM52, which is my top favourite. The meat is so rich in flavour, tender and so moist to eat. Also, it serves with sides dishes of roasted russet potatoes, frisee, oak leaf lettuce and truffle butter sauce. 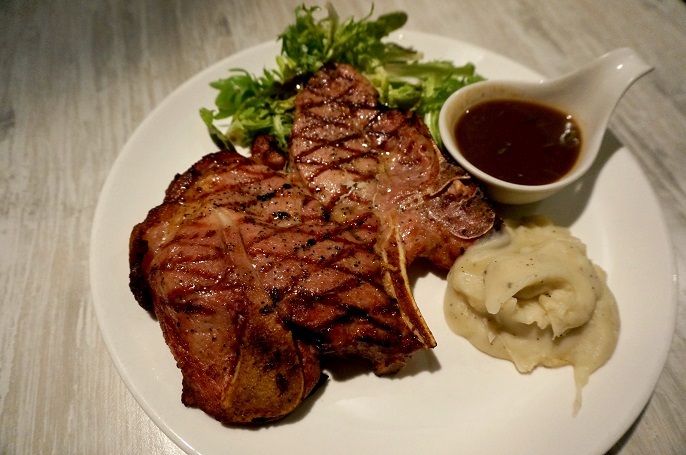 Ante not only has the pork chops, but also pastas and burgers that will catch your attention. 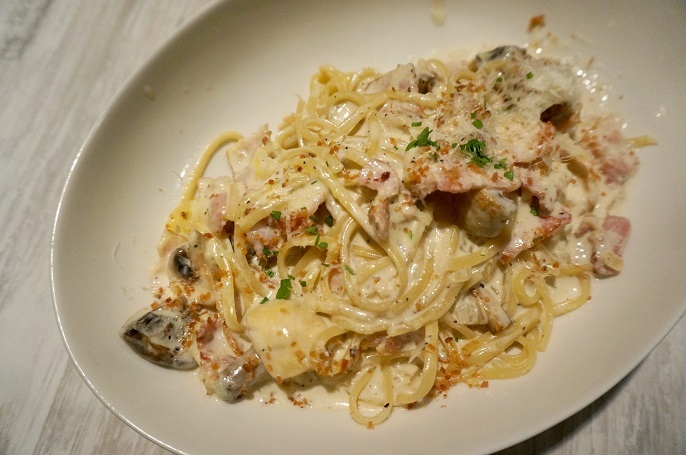 The Garlic Olio @ RM23, is one spicy pasta that served with streaky bacon, button mushroom and pangritata. Ante Carbonara @ RM30, has the streaky bacon, white button mushroom, parmesan cheese, parsley and egg yolk. Well, I think it's my first time having a carbonara with egg yolk. 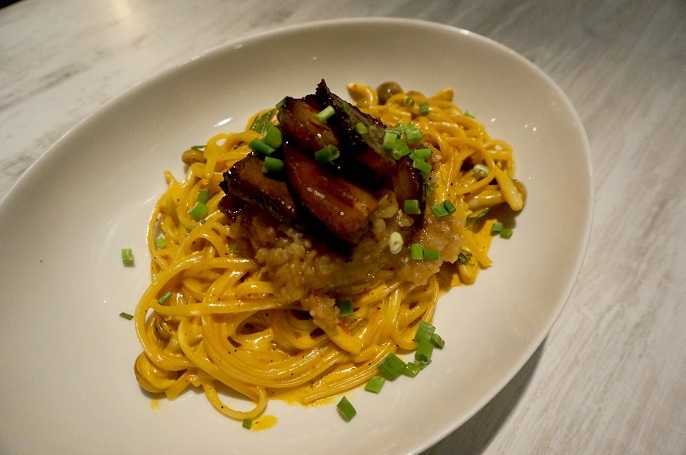 Char-Siu Curry Cream @ RM33, is a spaghetti made with house-made marinated char siu, shimeiji mushroom, grilled eggplans and chives. 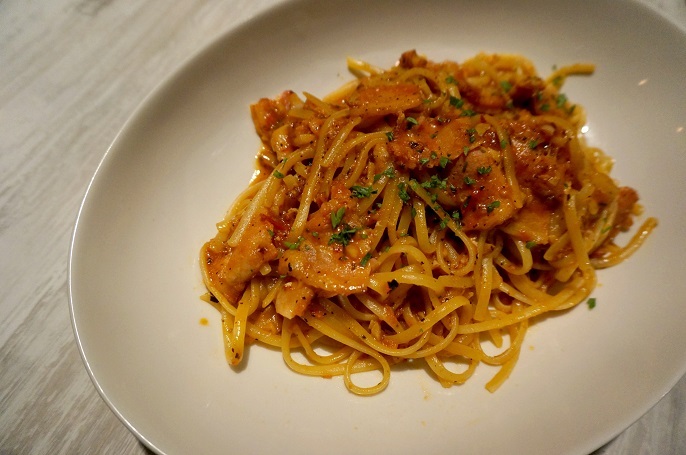 The roasted pork that placed on top of the pasta is so tasty! If you like pasta, this is the highly recommended one! We were all pigged out on that lovely evening at Ante. All pork chops were much bigger than one serving, so I would suggest you share it between 2 people. 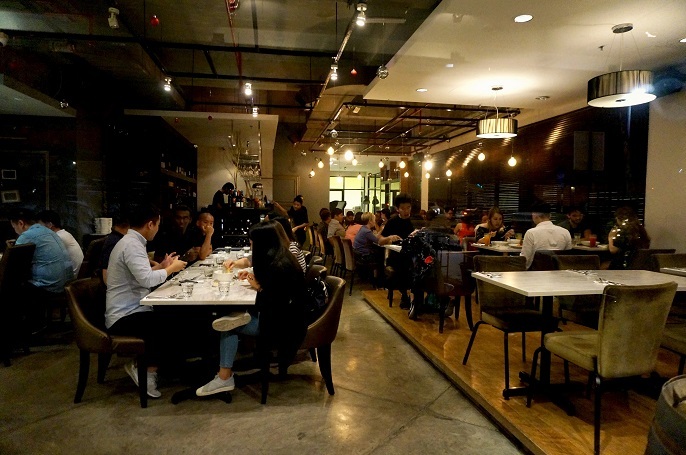 I have been to Ante Publika 5 times, and they never disappointed me in their food quality and services. Ever since I tried the pork chops at Ante, I would say nothing can beat the pork chops there. I brought my ex-colleagues, parents, sister, brother, girl-friends, and Lik to here, and everyone love it. So, I bet you will love it as well! If you never been to Ante, you should try it at least once! Ante, not only satisfactory, but it's awesome! When I travelling in Bangkok, I will visit Asiatique The Riverfront for sure. 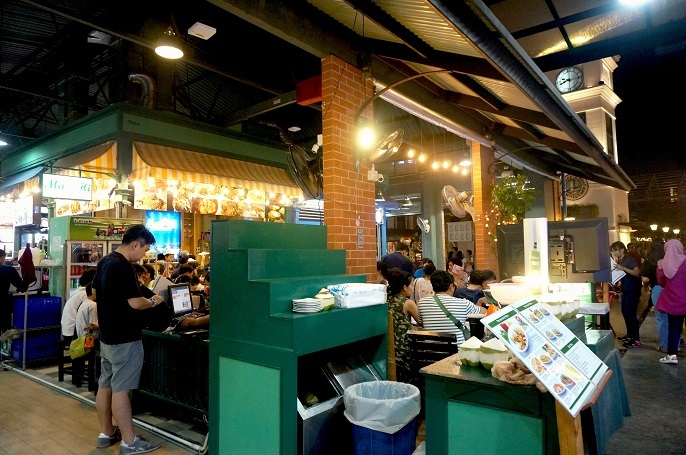 It's a night market that worth so much to visit for tourists, shoppers and eaters. Usually I will spend my dinner while do some shopping there. 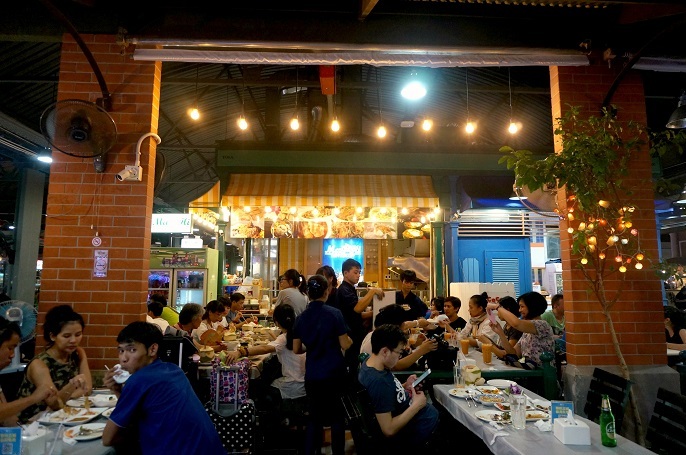 Everytime I will spend my dinner at the Chic Grill Seafood Restaurant, an authentic Thai restaurant that located at District 6 inside the market. 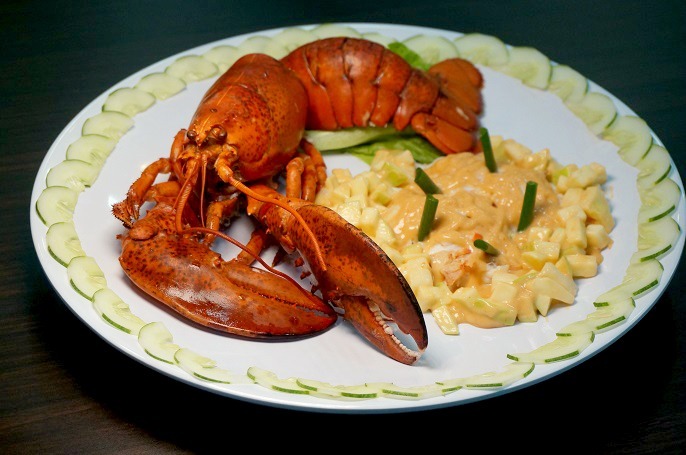 I like the restaurant very much because the food are delicious with reasonable prices. This time, I find Asiatique has some changes compare my last visit, as it has more Thai restaurants. So, we gave a try to a new restaurant, Ma Hi Thai Restaurant. 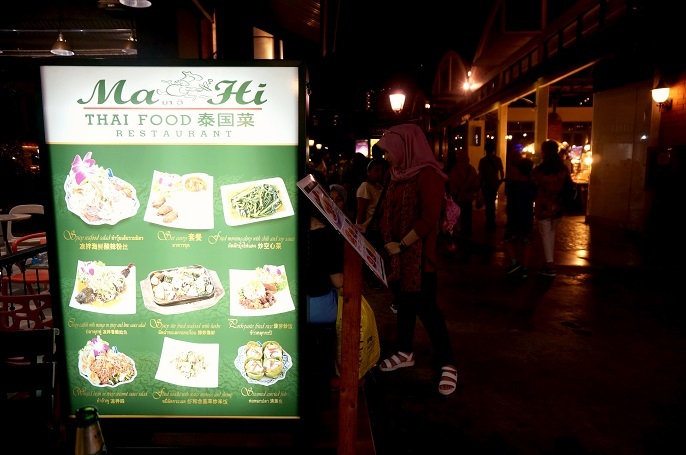 Ma Hi Thai Restaurant located somewhere near to the Chic Grill Seafood Restaurant. I can't remember the exact location, but if you can find the Chic Grill at District 6, you probably will see Ma Hi as well. The restaurant is quite big, but it was so busy during the time we went. There are many tables and chairs but all occupied by the customers. I realized there are more foreigners than the locals after we settled down in the restaurant. 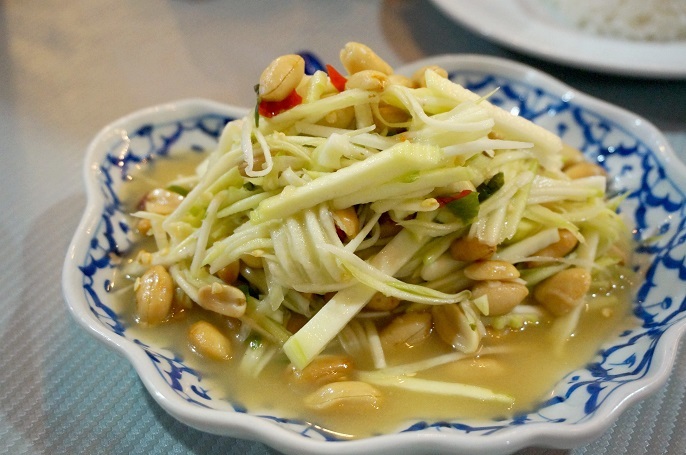 For appetizer, we ordered Green Mango Salad @ THB130, which is one of the best seller on the menu. 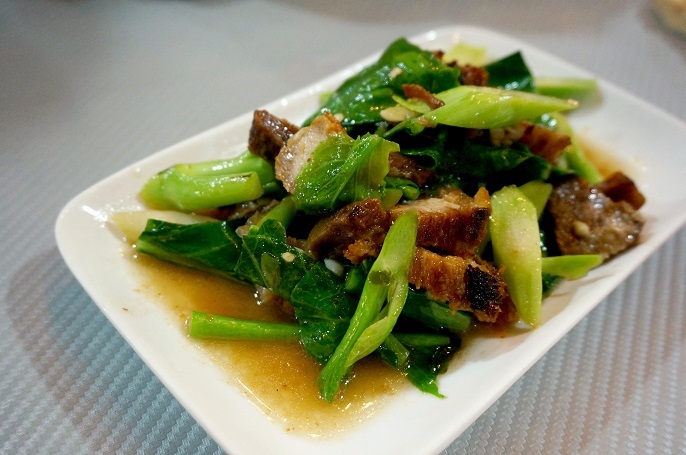 For the dishes, we had Wok Fried Kale Fried in Oyster Sauce with Crispy Pork @ THB140. The taste was average, but I find the crispy pork was too dried-out, and too hard to chew. 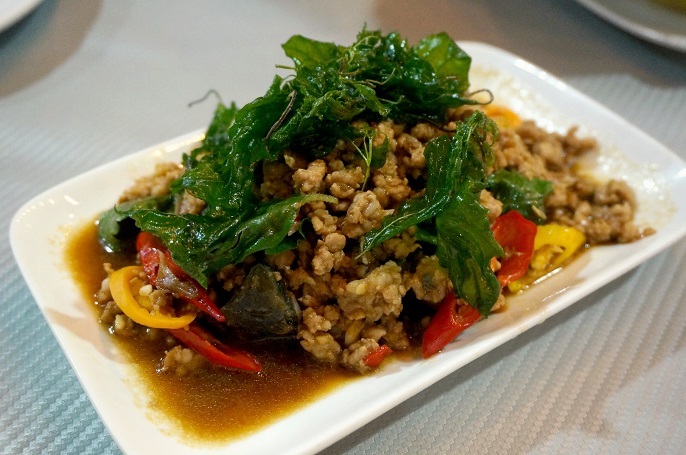 Second dish we had the Wok Fried Pork and 1000 years with Basil @ THB150. 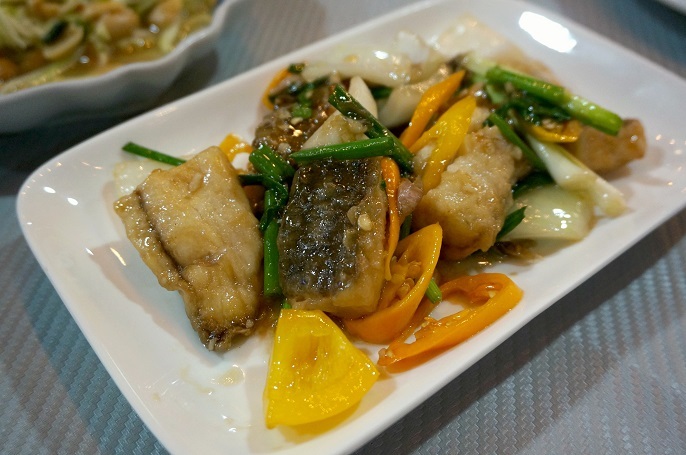 And the third dish we had is the Sea Bass Fish Stir Fried with Celery @ THB280. Although it stated as the best seller on the menu, I think the taste is just on an average. Also, the portion of this dish is quite small though. 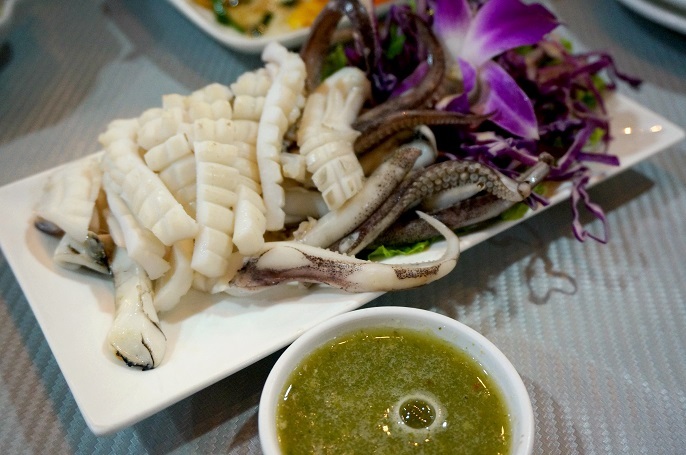 If you asked what's the best among the others we ordered, I would say the Grilled Squid @ THB130. 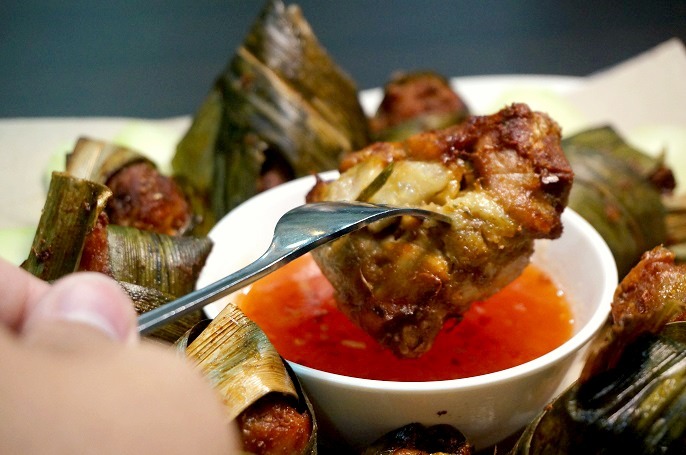 I actually have tried it at other Thai restaurants in Malaysia, so I have no doubt how good it is, especially the green chili sauce that comes with the dish. Overall, this restaurant is just average in my opinion, in terms of the taste quality of their food and restaurant environment. We were served quite fast and also got our food in a short time. But other than that, we didn't get any services. We actually had to go to the front cashier to ask for the checks as we waited for long time. I think I would not go back again, since there are so many other restaurants in Asiatique. For those who are visiting Asiatique for the first time, I would say the Chic Grill Seafood Restaurant is much better. 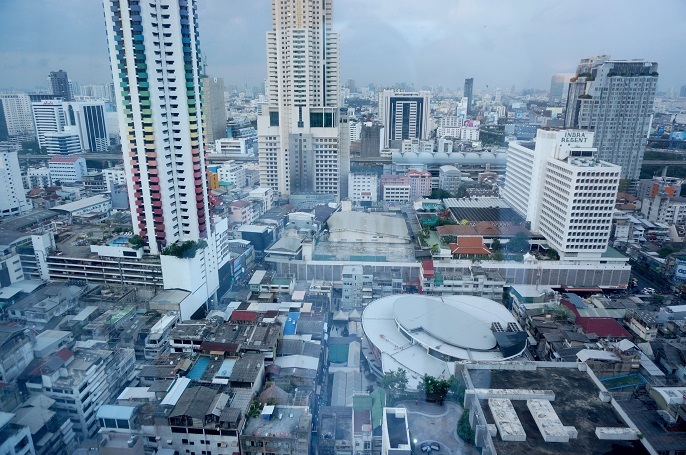 Back in August, I traveled to Bangkok again. I can't remember how many times I have been to Bangkok. 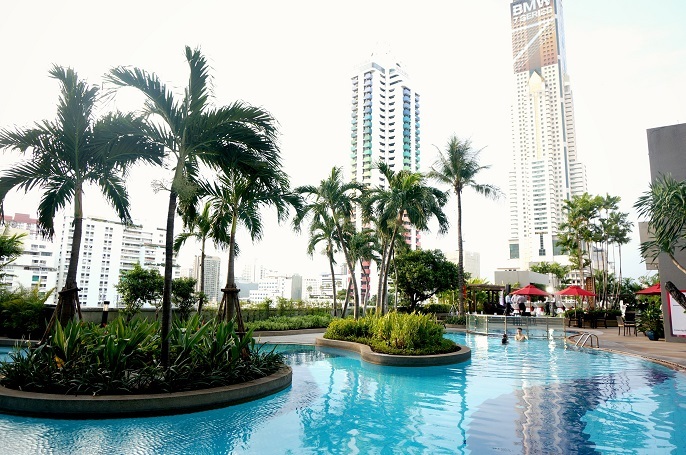 There are too many reasons to come back to Bangkok again and again. First, the shopping experiences, the authentic Thai food, only 2 hours flight from KL, many affordable hotels etc. Too many reasons to count! 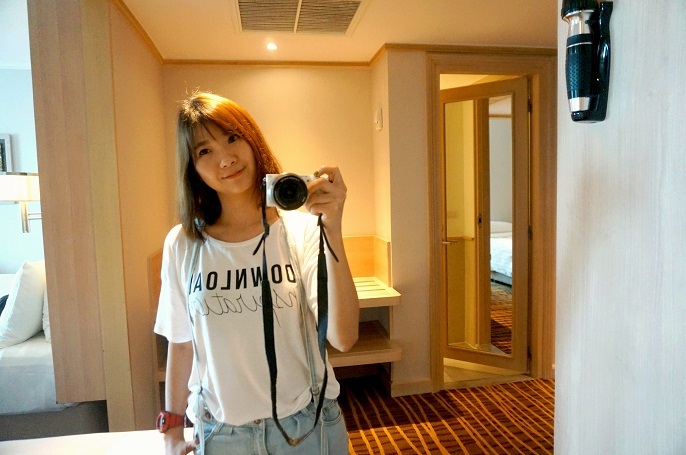 Each time I visit Bangkok, I prefer to stay at different hotels to have different experiences. 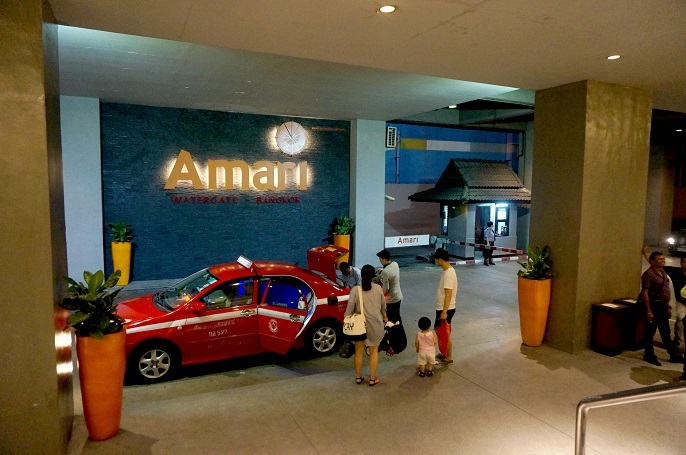 So without any special reasons, this time I choose to stay at a 5 stars hotel, which is within the Pratunam district of Bangkok. 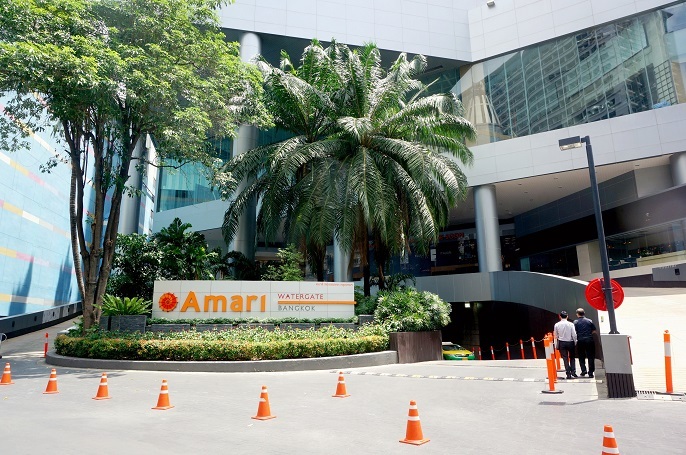 Amari Watergate Bangkok consider a famous hotel at the Pratunam area if you lookout from the hotel booking websites. 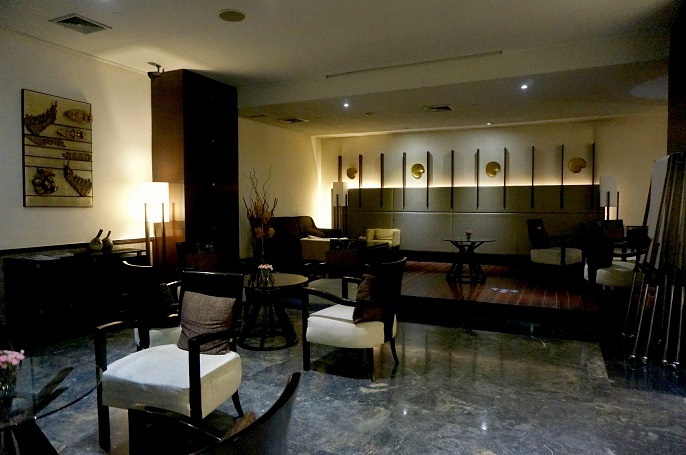 The hotel is a bit pricey than the other boutique hotels; not only because it is rated at 5 stars, but also it is conveniently close to many attractions with short walking distances. 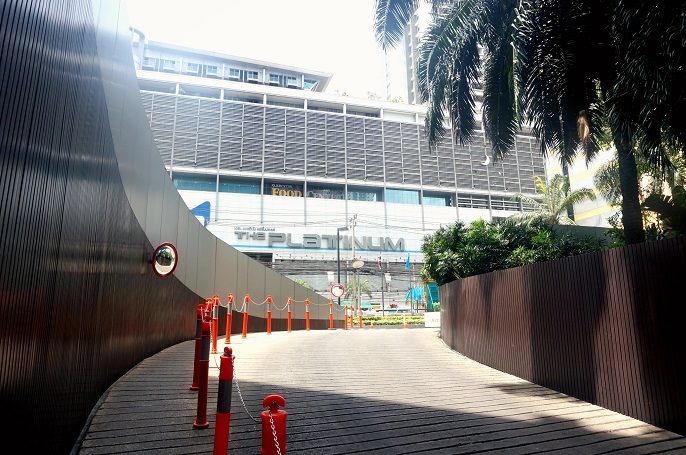 For example, the Platinum Wholesale Mall is just located in front of the hotel, it is about 10 minutes walk to Central World Plaza and Erawan Shrine, and about 20 minutes from Siam Square and Siam Paragon. 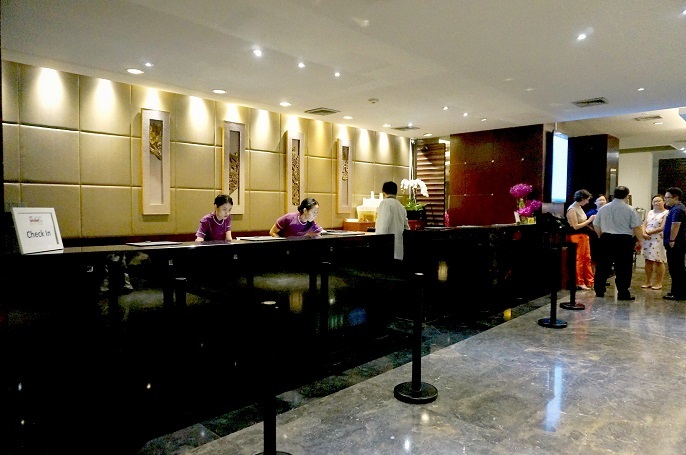 The hotel was very busy when we arrived there. But I have to say that the staffs are all very friendly, patient and helpful. 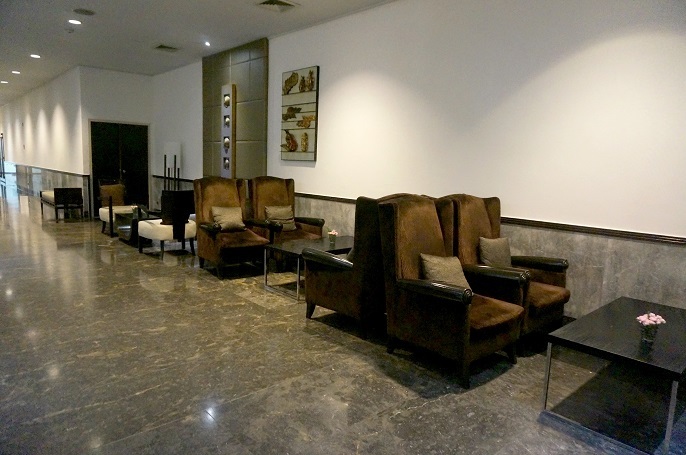 The waiting area at the lobby is spacious with relaxed ambiance. Good for chilling together with your friends and families. 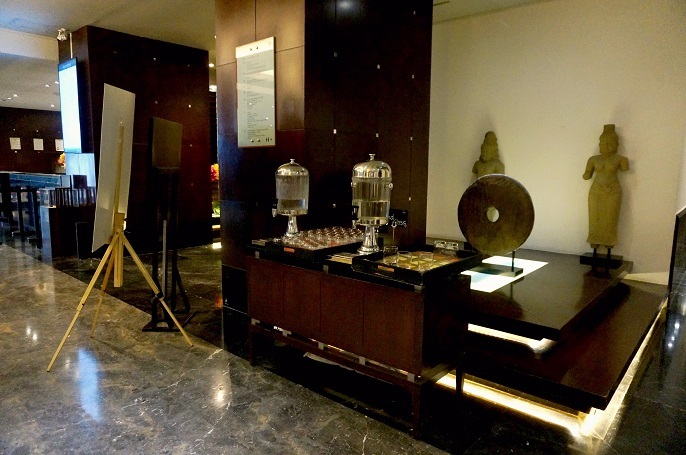 Complimentary ice-waters everyday at the lobby. 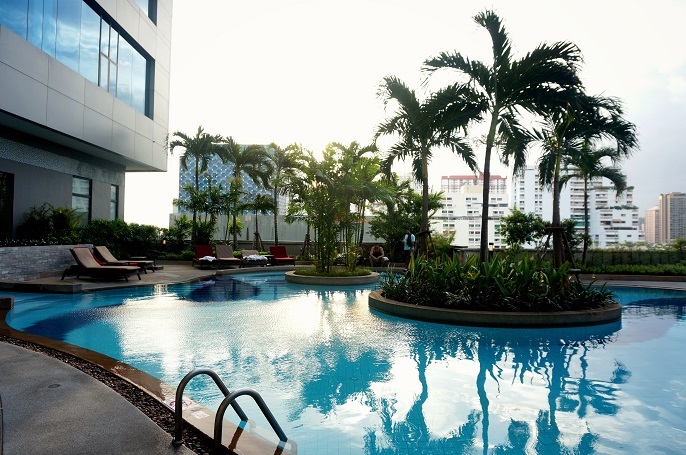 The hotel has an outdoor swimming pool on the 8th floor. We booked the Grand Deluxe Twin Room and the room is surprisingly small. 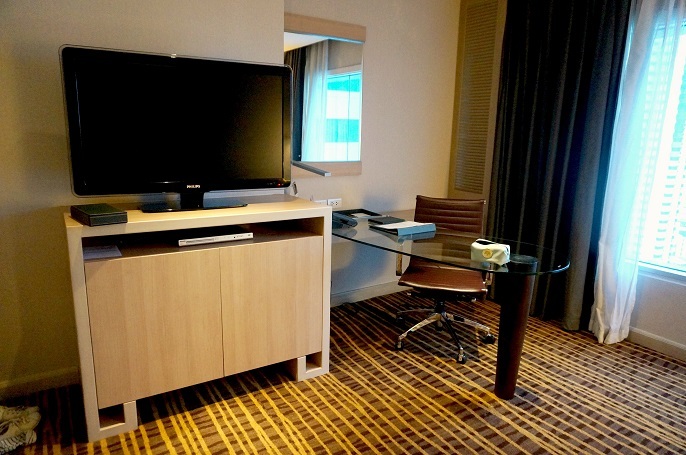 Right in front of the bed, there is a TV and a working desk. There are some famous channels are on the TV such as MTV (my most favourite when I'm on vacation), HBO, BBC, CNN, ABC Asia Pacific, Discovery etc. Also, the free Wifi at this hotel is good and quite stable. A comfortable couch for you to enjoy your suppers while watching TV programs. 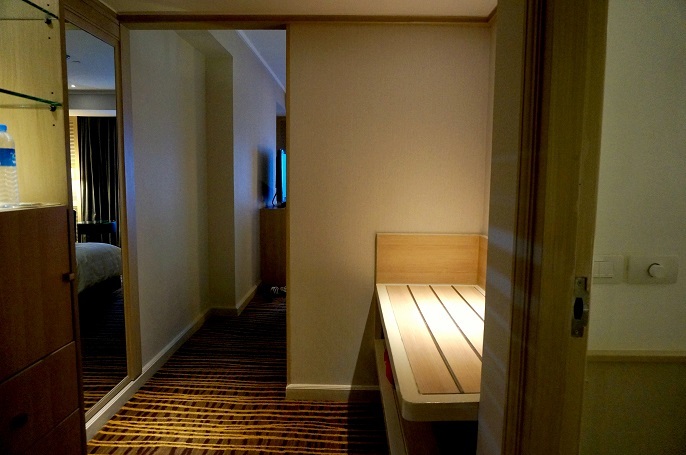 Not many storage is available inside the room, but the luggage rack is good enough to keep the room neat and tidy. Move on to the bathroom. 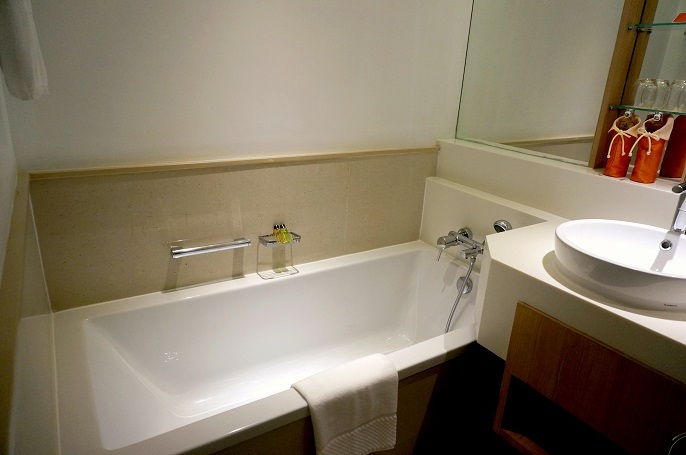 There is a bathtub and it is well maintained and clean. 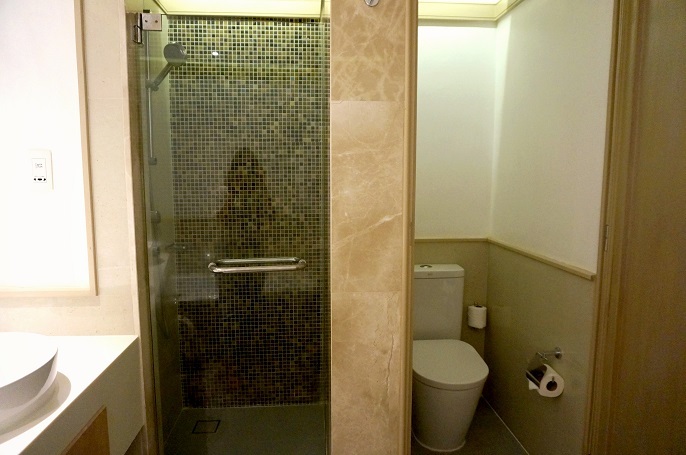 To me, I prefer to use the shower instead of the bathtub, so it's good to have a separated single room for the shower. 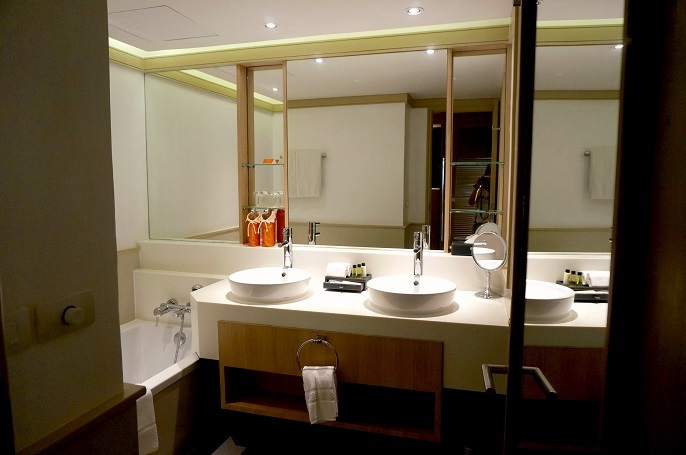 Some other hotels may have bath and shower combined, which I don't like. 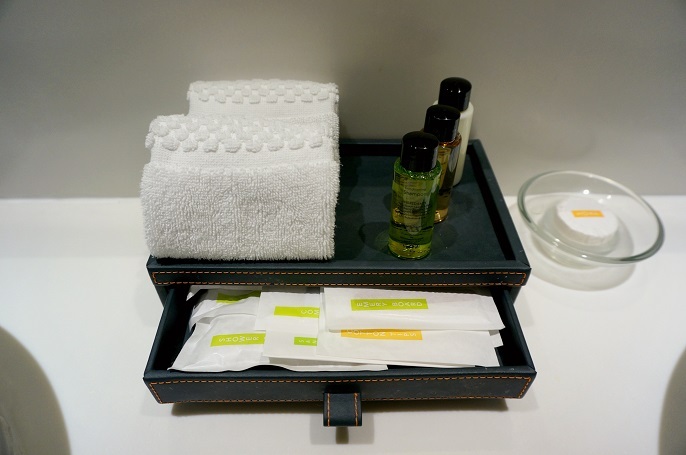 Free toiletries are available at the sink area. 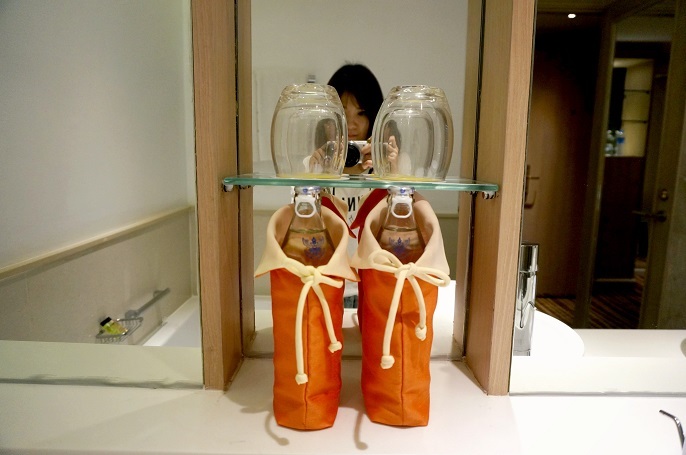 Also complimentary bottled water will be refilled everyday. 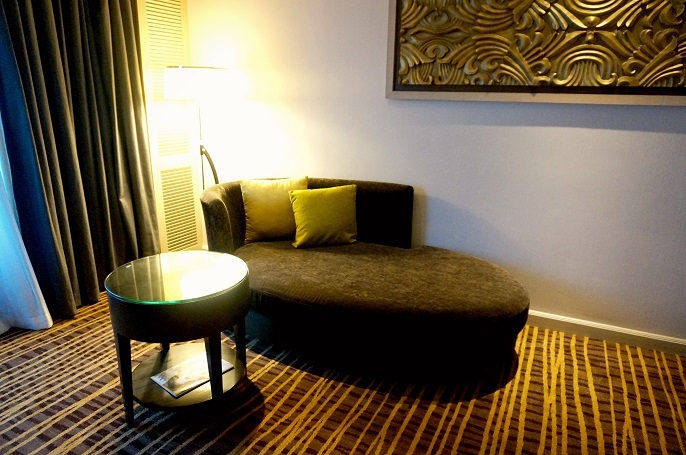 We have our room with overlooking views of the city centre. During this trip, we only ride with Uber and I think it becomes the best way to get around Bangkok. Not to mention about the traffic in Bangkok, you just gonna have a good planning on your time to avoid the roads in Bangkok during peak hours. In my view, Tuk Tuk in Bangkok is fun to travel with, but I think Uber worth the money after all. 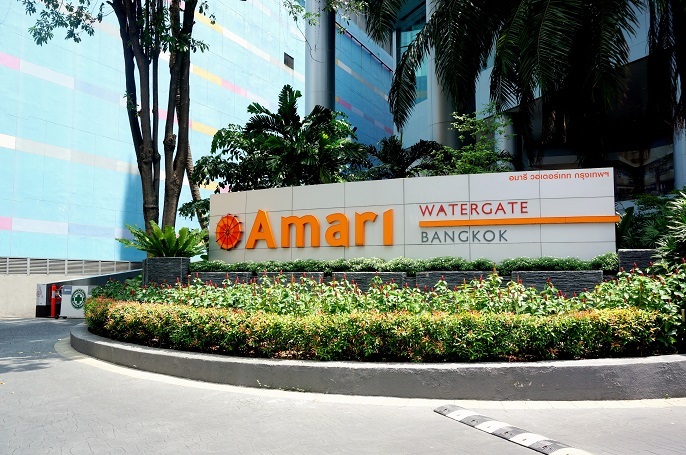 Amari Watergate Bangkok indeed a pleasant experience for us. It's kind of a life time experience staying in a 5 stars hotel. 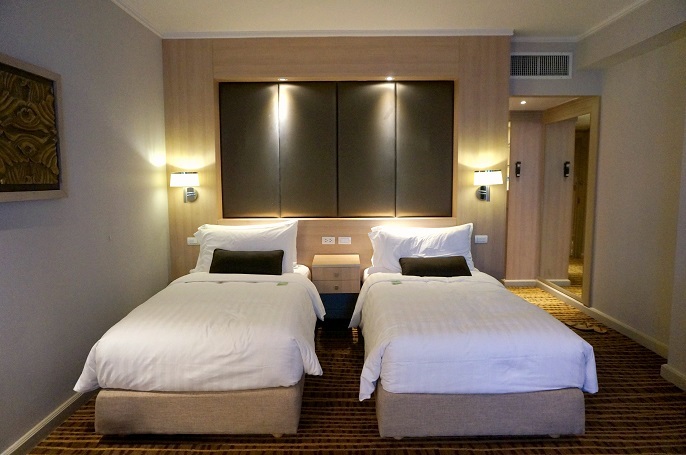 However, if you stay outside all the time with sightseeing and shopping, I would prefer to stay at the reasonable boutique hotels. We paid total RM1730 for 4 nights, so I think it's quite expensive. All in all, if you are a looking for a great hotel to pamper yourself on your vacation, I would highly recommend this hotel. Just a quick catch up with the recent Korean Indie musics that I am in love with. I will try to update more frequently, at least once a month with my music sharing. So, here you go my November's favourite songs! That's Nothing by Coffee Boy. Try to understand the lyrics behind the song. I think it can give you a good strength to move forward, especially when you feel bad. Hope it helps to kick away your negative emotion. Well, I believe everyone deserve to have a happy life. The reason we broke up by Han All. I don't know who is she, but honestly her voice is just so calming! This song is amazing all it's own and touches my soul, though it's a sad song by looking at the song title itself. Come Out, Let's Walk by 20 Years of Age. It's a song that can cheer you up on a tough day. Simply listening to this song can takes you into a positive mood and makes you feel happy! The song lyrics is just as cute as the melody! The Manual by Eddy Kim. Eddy Kim is not only a singer, but also a song writer and guitarist. Glad to know him, because he has many other nice songs under his channel too! Probably I will share more in the next post! I really enjoy the Korean Indie songs. I always listen to my youtube with all these songs when I need inspiration on my works. Though I cannot understand the lyrics, but sometimes the rhythm can simple make you feel good and comfortable. Just go with the flow, and I am sure you will like it as well! What should we talk about today? 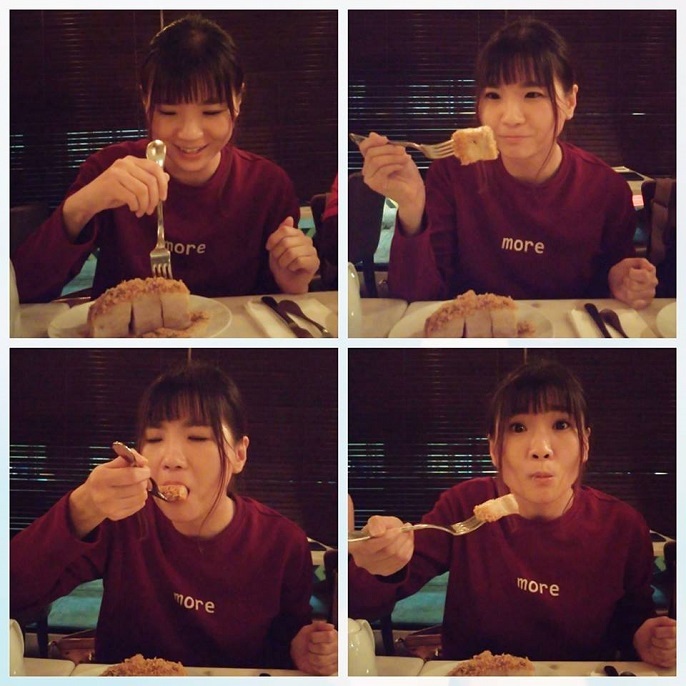 Do you love Chinese food? 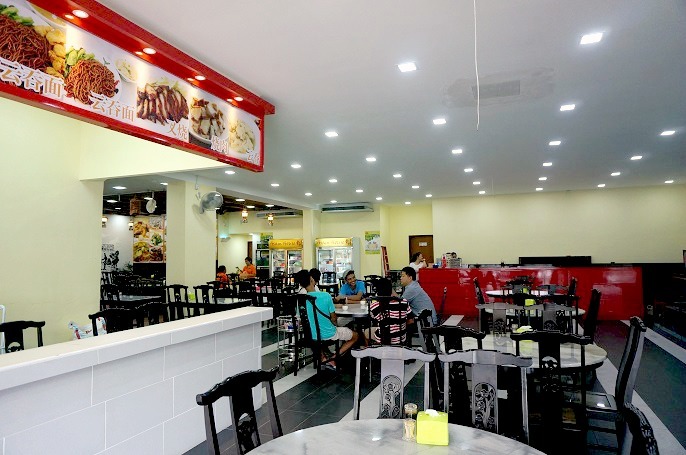 Home Style Kitchen Asam House is a newly renovated Chinese restaurant which located at Bandar Puteri Puchong. 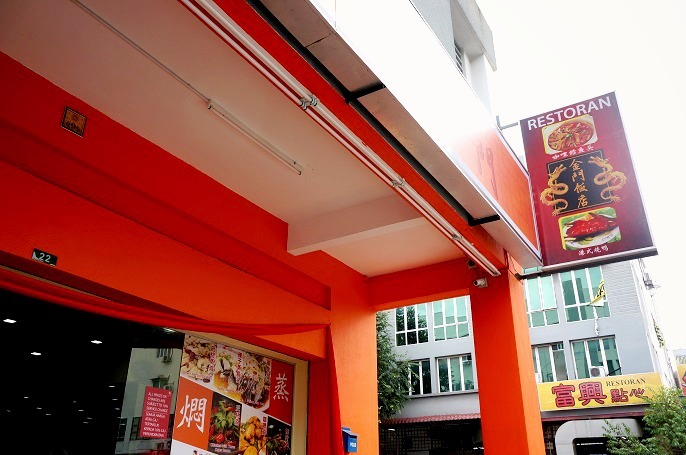 The restaurant is very easy to spot at the main road of 2/3 because the 2 units combining shoplot are all painted in orange, also the signboard is in a sharp yellow-orange colour. 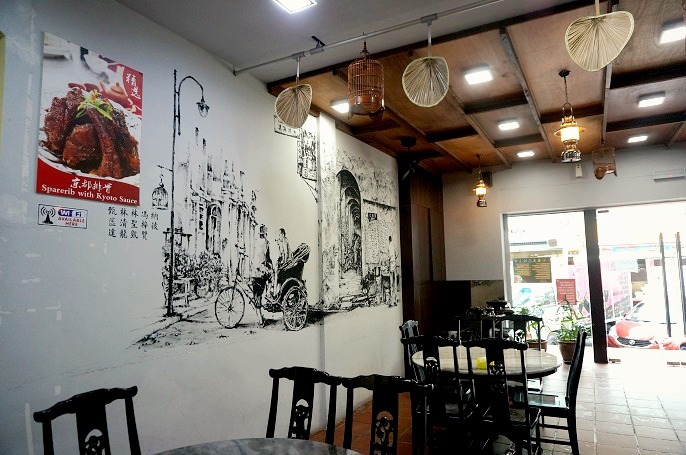 You might have doubted what kind of food that Asam House is offering by looking at the pictures of it's very simple interior; plus there aren't many customers inside the restaurant. That's probably because the restaurant is still very new. 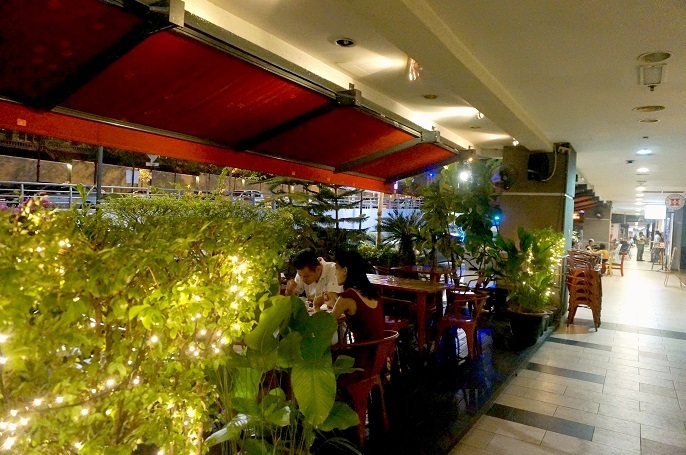 Anyhow, the restaurant is clean, spacious, and also it filled with so many different savory dishes. Come! 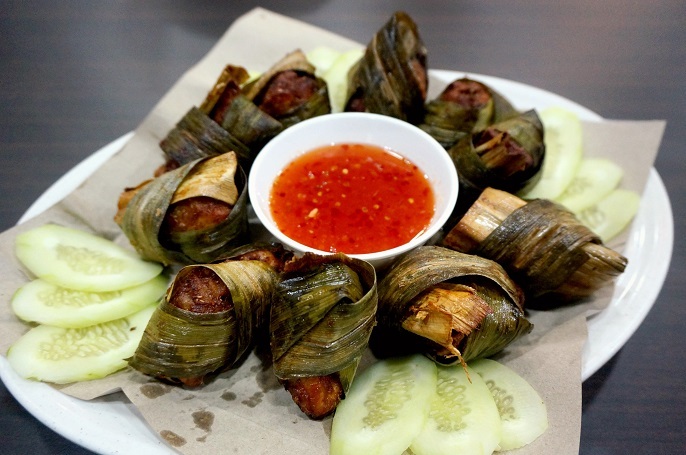 Let's follow me to eat at Asam House now! How about starting the menu with their fish dishes? 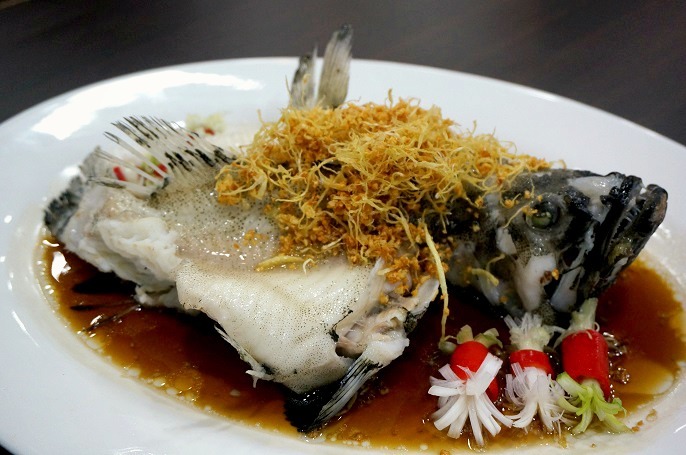 Steamed Dragon Grouper 蒸龙虎斑 @ RM108.00. The grouper was steamed with the superior soy sauce, also with a touch of ginger and garlic. 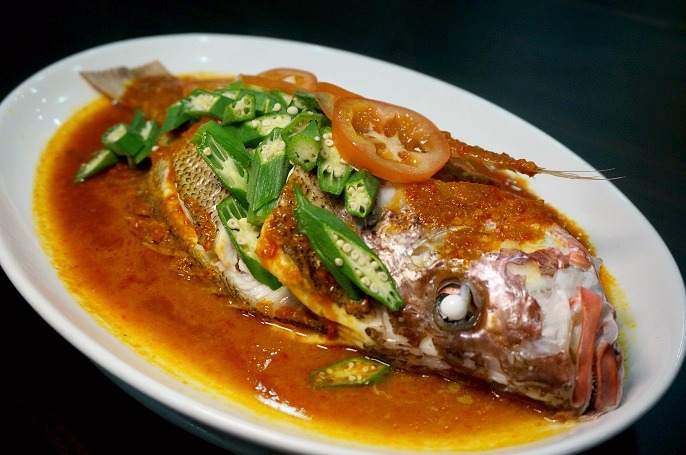 Steam Green Pepper Pomfret (青椒蒸金昌) @ RM48.00. 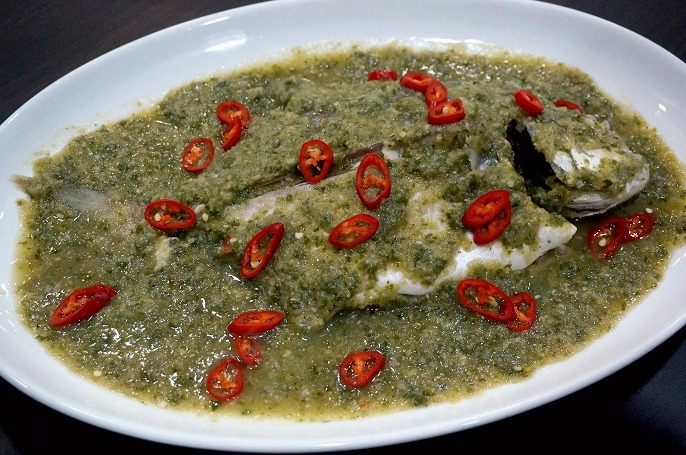 It's one of the signature fish dish that serves with grind green pepper sauce. The asam source is perfectly good for stimulating appetite. Move on to the crab dishes. Butter salted Egg Crab (黄金蟹) @ RM88 for 2 pieces. 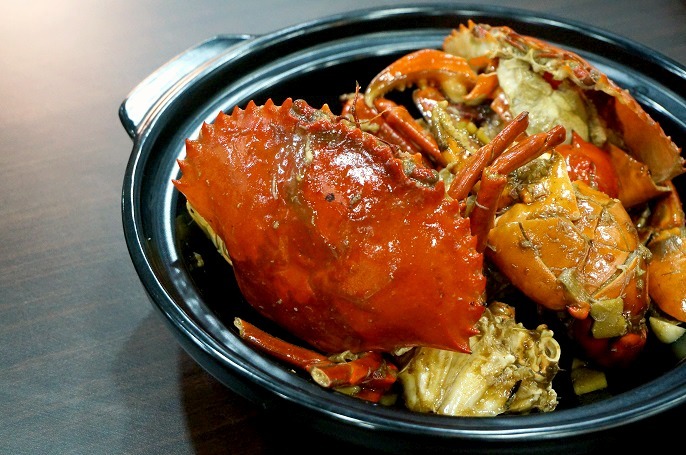 XL Salty Wine Crab (XL盐酒焗蟹) @ RM88 for 2 pieces. 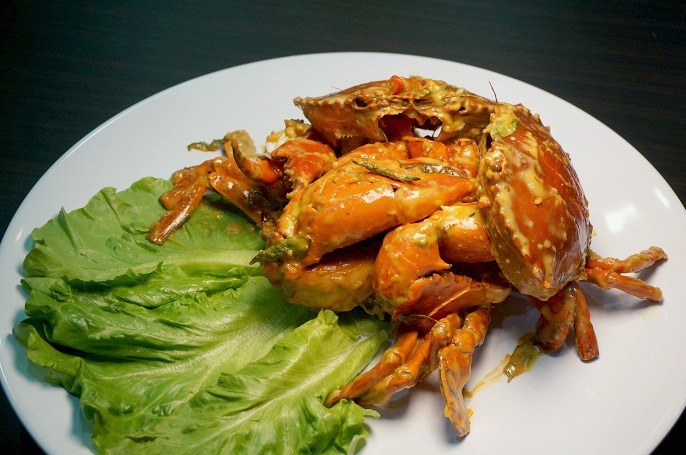 This dish has a very pleasing freshness with the wine sauce, but also keep the freshness for the crab meat. 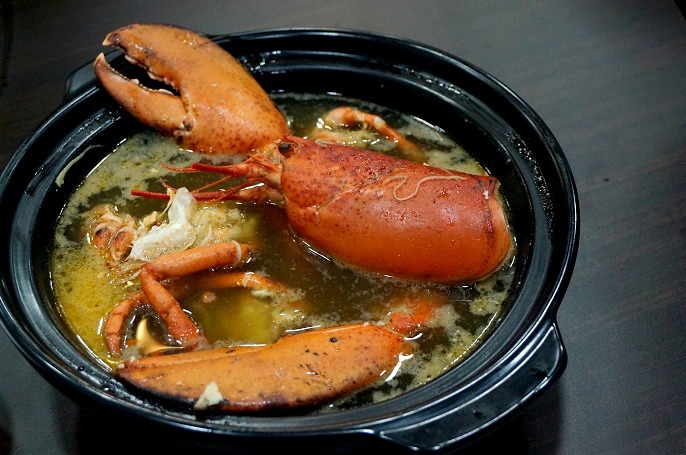 Boston Lobster Soup (一虾两味龙蟹汤) @ RM230.00. I like the soup very much as it's not very heavy and rich, but is somehow light and fresh with full of flavour. This dish is perfect for someone who prefer light, and flavourly tastes. And then some prawn dishes. Pumpkin Shrimp (金瓜明虾) @ RM28.00. Pumpkin with prawns are heavenly! Love the rich pumpkin sauce which is velvety smooth and creamy. 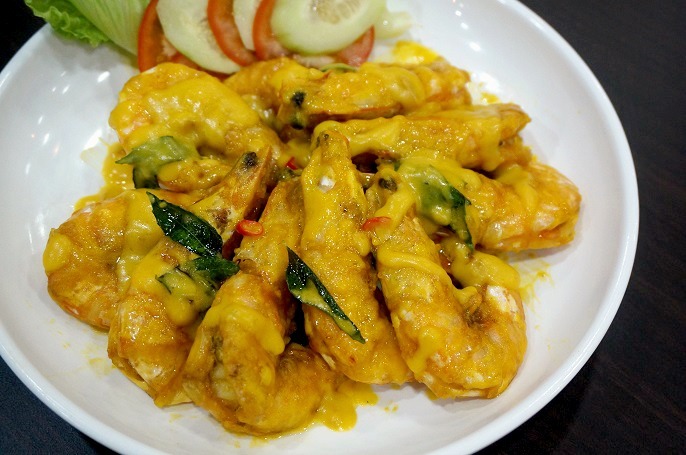 Asam Shrimp (Asam明虾) @ RM28.00. 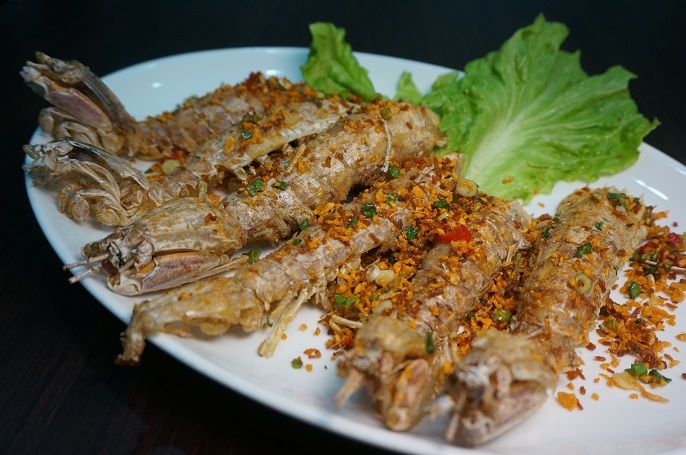 Garlic Fried Mantis Prawn (蒜香濑尿虾) @ RM48.00 for 6 pieces. I personally do not like this dish very much as Mantis Prawn is always not worth eating because there's not much meat on them. 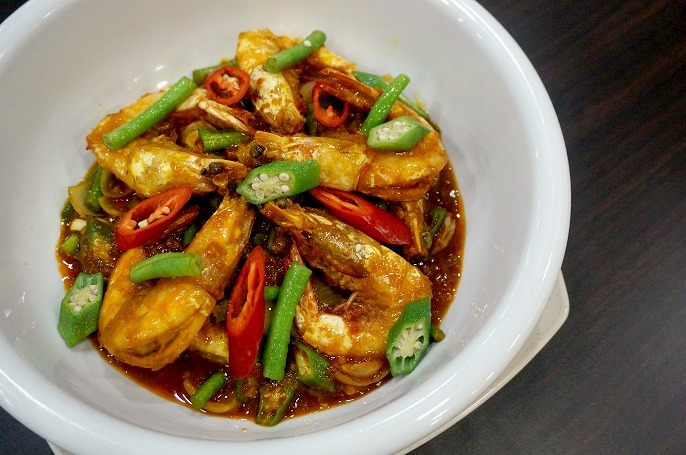 Some other seafood dishes that available at Asam House. 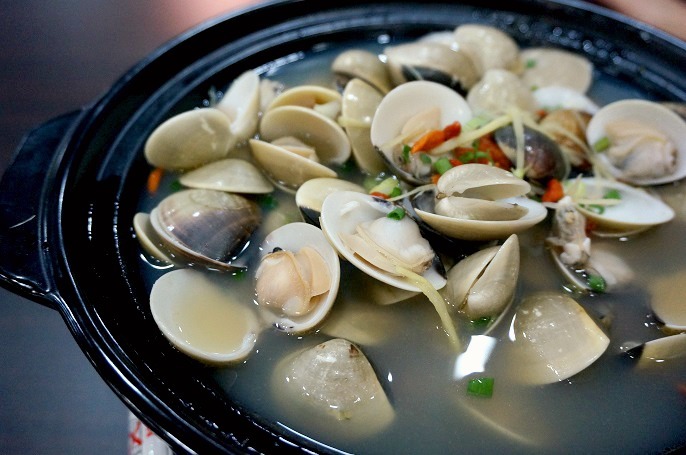 Clams in Clear Soup (上汤啦啦) @ RM28.00. It is served with a light clear soup loaded with lots of sweet and fresh clams. Thai Style Garlic Squid (泰式蒸苏东) @ RM32.00. I am sure the spicy and sour sauce is gonna be delicious enough to stimulate everyone's appetite. Steamed callop (扇贝) @ RM32.00. 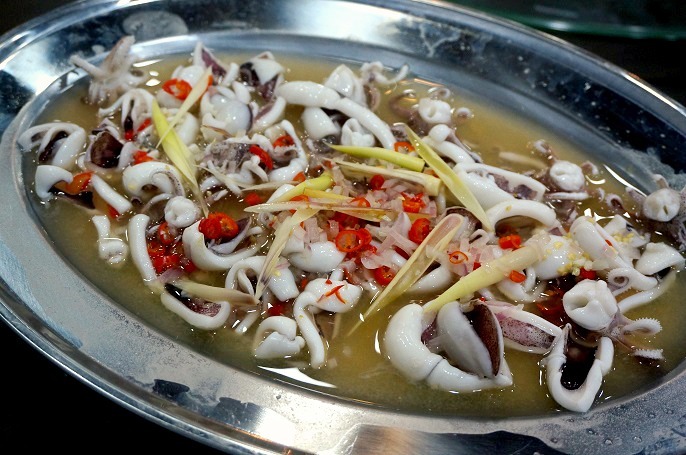 This is one famous and also a must order dish in China. 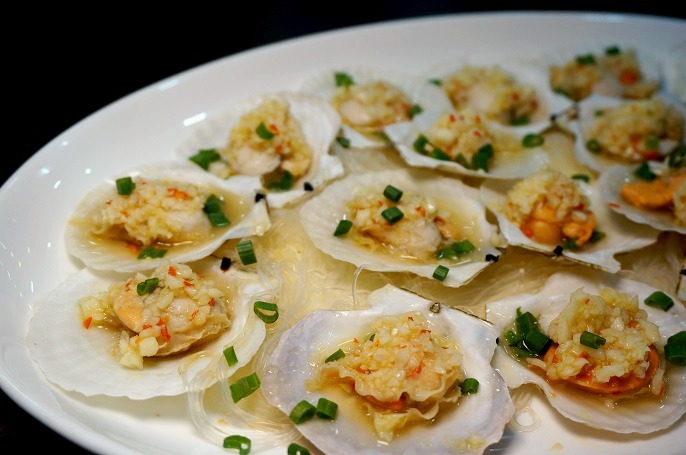 Garlic Spicy Abalone (蒜草蒸生鲍) @ RM88.00 for 3 pieces. 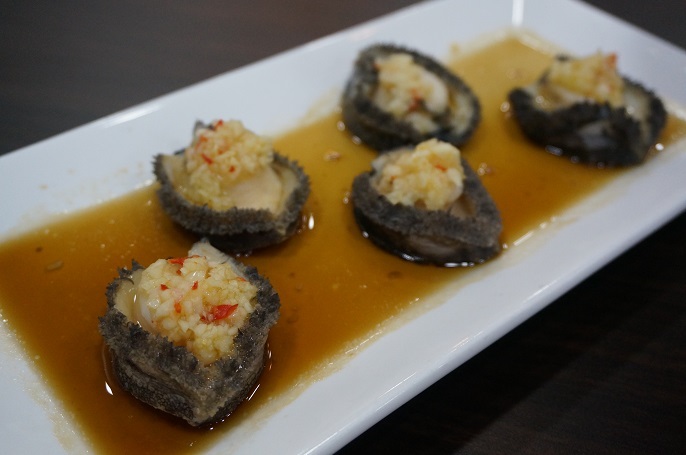 It's a braised fresh abalone seasoned with garlic in spicy. Spicy Sour Clams (酸辣蛤) @ RM18.00. 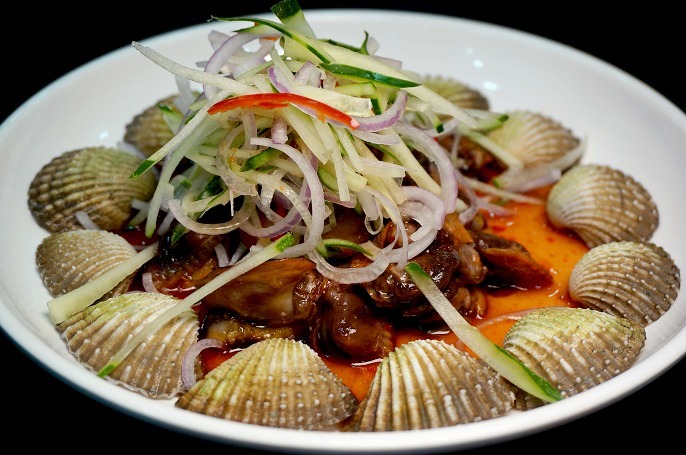 It's a special dish that the sweet flavours of clams pair perfectly with the spicy chili and a bit of bean sauce. 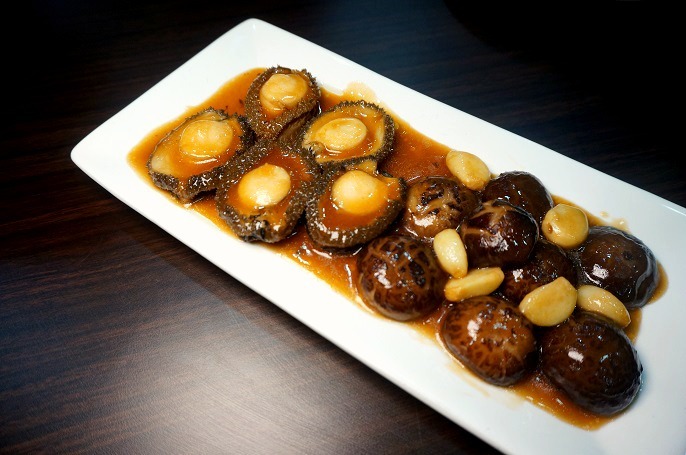 Braised Raw Abalone (红烧生鲍) @ RM88.00 for 3 pieces. Maybe it is slightly expensive, but I think you must try a least once! 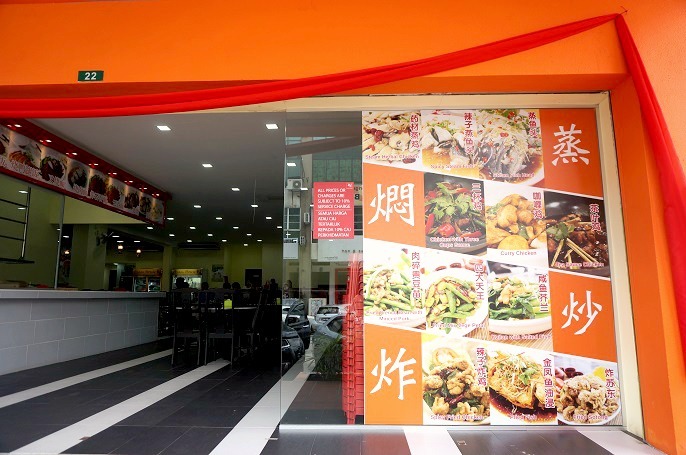 Lastly, there are also many popular Chinese dishes with affordable price at Asam House too. Pandan Chicken (香叶鸡) @ RM4.00 per piece. Love the moist and tenderness of the boneless chicken. Sweet and Sour Pork Ribs (京都排骨) @ RM26.00. 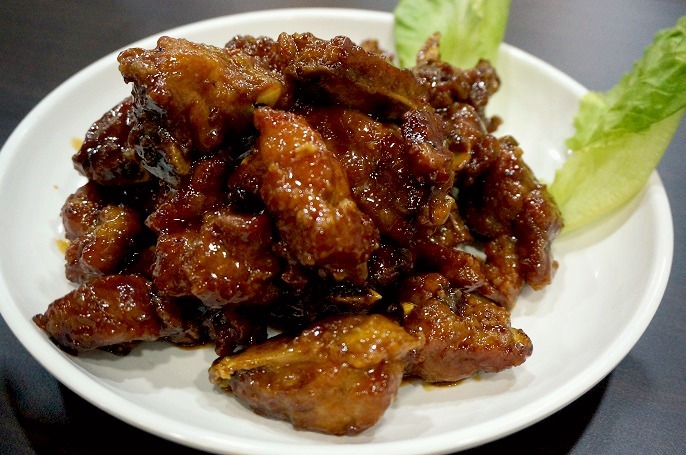 One of my favourite at the restaurant because of the ribs are so tender and juicy! 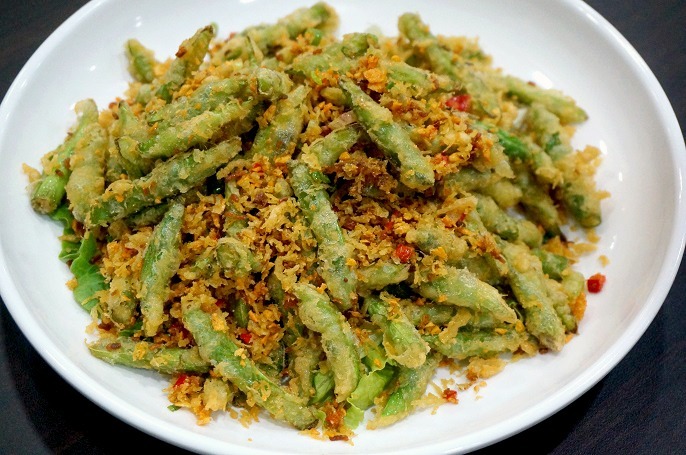 Garlic Stir Fried Longbeans (蒜香双豆) @ RM16.00. It can be one of the finger food before the main courses are served. 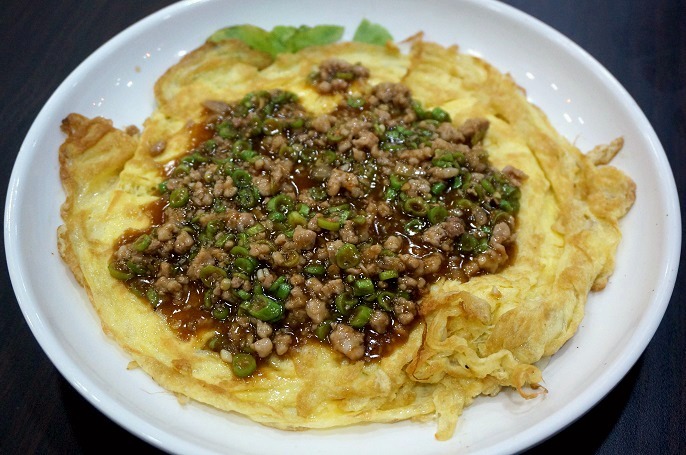 Minced Pork Fried Egg (金沙蛋) @ RM16.00. A simple dish for those who love minced meat with the fried egg. 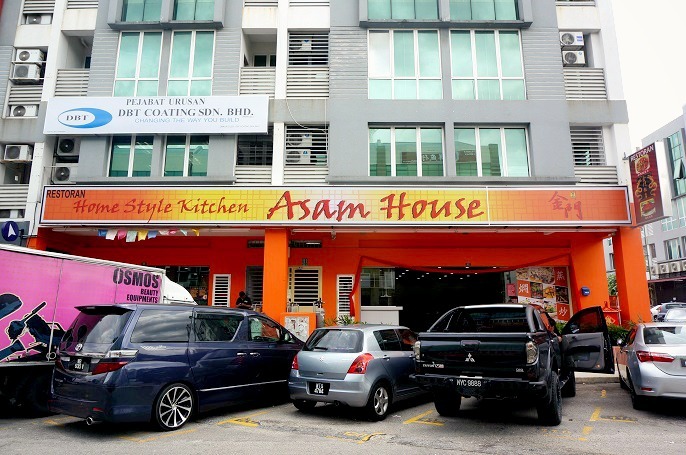 I think Asam House is a good place where food and family come together. 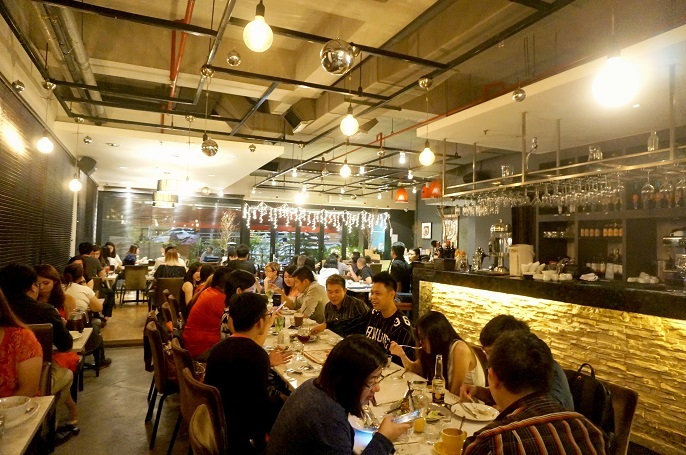 It's a comfortable place with affordable price for you and your family to enjoy the Chinese cuisine. Indeed, I recommended this to my elder sister since she stays at Bandar Puteri. 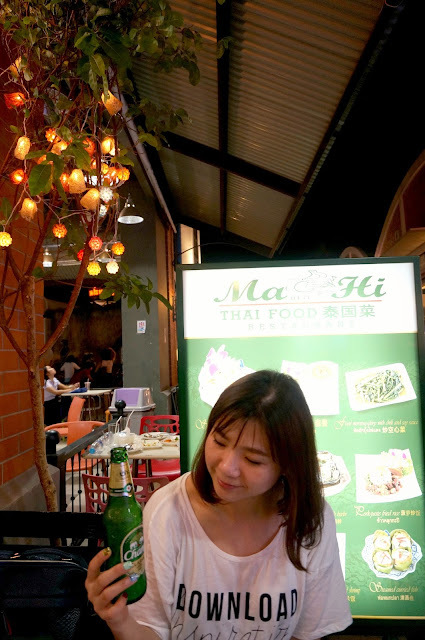 I am glad that she said her family enjoyed the food there very much, especially the sweet and sour pork ribs,Thai Style Garlic Squid, pumpkin prawns, and Steam Green Pepper Pomfret that I suggested to her. 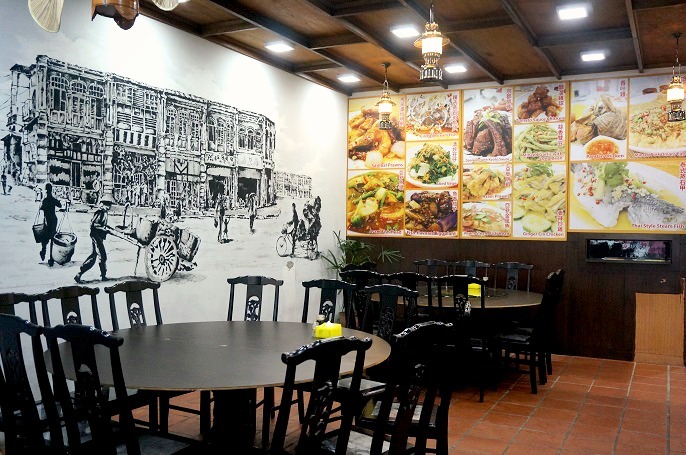 If you stay somewhere near by the Asam House, I think you should visit there at least once to try out their signature dishes.